Once in a while, a nurse is forced to push the Reset button and take a little time away from her career to reassess her goals and values. Here are some of the lessons the past two months have taught me about life, work, and the pursuit of contentment. You are reading page 3 of A Time to Heal. If you want to start from the beginning Go to First Page. LisalaRN99 works as a staff RN. This is a very good, thought provoking article. Thank you. As a nurse who also crashed and burned, although managed to keep it private and out of the work place, I, too, have had to learn how to take care of myself. I have been toying with the idea of going to nurse practitioner school now that I have finished my BSN (finally!). I'm 55 years old and have been a nurse for 14 years. When you said you no longer needed to be on call 24/7, that's when it hit me! What am I thinking!! My whole original plan was to become a nurse educator! Where did all this glorified ambition come from all of a sudden! No NP school for me now! No siree! You have helped me finally lay that pie-in-the-sky dream to rest! I'll go get a MSN as a nurse educator like I originally planned! Thank you friend. And thank YOU---this made my day! Great post! I've been a nurse for 30 years & was diagnosed with bipolar disorder 8 years ago. Nursing is becoming very difficult for me too. The calamity of it causes lack of focus & distraction. Working a construction job sounds more enjoyable! 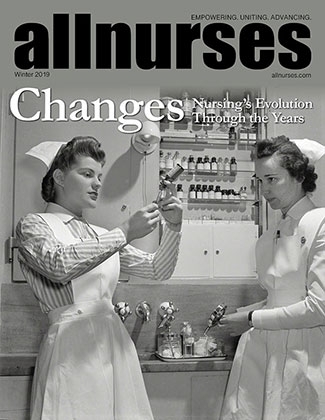 Thank you, and Welcome to Allnurses! You know, I wonder if those of us who are diagnosed later in life have a more difficult course because it's gone unchecked for so long. I began to suspect BP over a decade ago when I picked up a copy of Jane Pauley's book Skywriting and immediately saw a lot of myself in it. Even my sister skimmed through the pages and said "I think you have that." But I was too scared to do anything about it, because the only medication I knew about at the time was lithium and I wasn't going to take that. I also refused to go see a psychiatrist because then everyone would think I was crazy. This article hit me hard, because I can feel the way you struggled much like how I did. Alot of us have struggled, but we keep perseverance. And your journey showed nothing but perseverance. Even despite the turning point in your career, you took a step back, re-analyzed your identity and what you want in life, and came right back with a plan. You didn't give up. Your sharing of stories and contributions to your family, friends, and heck even strangers like me only goes to show how great of a person you are and your contributions to the world. That's an accomplishment!